In early 2001, Super Troopers busted on the scene and became a cult classic in the comedy world. I was a freshman in high school and it seemed to be the the movie that everyone was talking about. For years, fans have been clamoring for a sequel, but the guys at Broken Lizard had other projects drawing their attention. It wasn’t until fourteen years later that Broken Lizard kick-started a campaign through IndieGoGo to finance a potential sequel with a goal of raising two million dollars. Fans from all over put their money where their mouth is and threw enough money at it to achieve that goal in just over twenty four hours. In fact, over the course of the campaign, they raised over double the requested amount for a little over four and a half million dollars (one and a half times the budget of its predecessor). 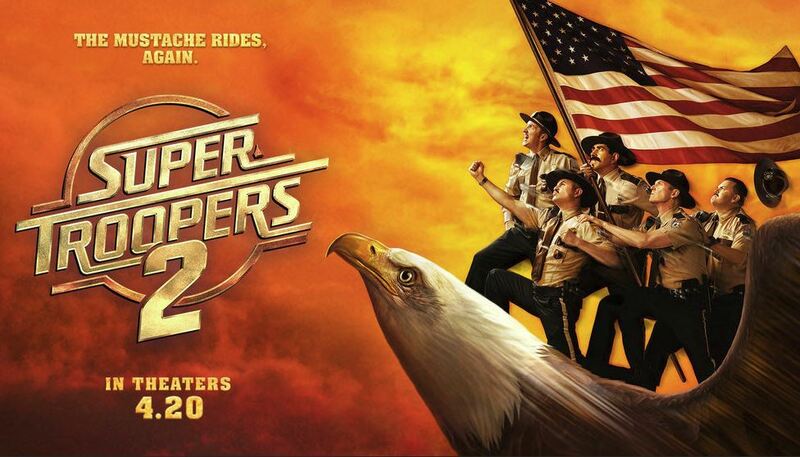 With that money raised, Super Troopers 2 finally got the green light – seventeen years later. The original cast is back as our five former Vermont state troopers working a number of miscellaneous jobs before being presented with an opportunity to regain their badge. The story is pretty basic when it comes down to it, though I wasn’t expecting anything substantial when it comes to this zany comedy sequel. A large plot of land on the US/Canadian border becomes US territory and the US needs officers patrolling it. Of course, the Canadians inhabiting that land aren’t too thrilled, nor are the rivaling mounties who used to patrol it. Some shenanigans ensue (don’t pistol whip me please! ), some crimes are discovered, and I’m sure the perps would have gotten away with it if it weren’t for these meddling troopers. The troopers pick up their chemistry right where they left it off seventeen years ago. That shouldn’t be much of a surprise considering they’re the five guys who make up Broken Lizard and are writing the parts that are meant for their characters. Kevin Heffernan is the stand-out once again as the always loud and incredibly obnoxious Rod Farva, but teeters on the brink of too obnoxious occasionally. Director and star Jay Chandrasekhar returns as Trooper Ramathorn who endures some psychological shifts as his body adjusts to an addiction to female hormone pills which plays to what I disliked most about this movie – the stereotypes and the constant dependency on them. Thorny’s dependency on the estrogen turned him into a sensitive and blubbering caricature of a female psyche. Even more frustrating to me was the constant jabs at Canadian stereotypes accompanied by poor thick French-Canadian accents by the likes of Will Sasso, Hayes MacArthur, Tyler Labib and none other than Rob Lowe in his surprise role in the film as former hockey player and current small-town mayor, Guy Le Franc (who has a very questionable judgment on what is and what isn’t a punching bag – you’ll know what I’m talking about). Did we really need a sequel? Especially after all this time? Not really, but if you liked the first movie, you’re probably going to be onboard with this one too. It’s filled with so many callbacks to its predecessor and silly twists and turns that should definitely lead to some laughs here and there. Although it’s quite ridiculous at its core, you probably already know what to expect when seeing Super Troopers 2. Just don’t expect it to have the same following.